Checking availability and booking is easy using our booking calendar below. Just select your preferred dates and number of nights. You will then be taken to our booking site where you can explore different dates and prices. Prices will vary depending on the vehicle you select, the season and number of nights. You can also add other extras such as unlimited mileage, European cover, additional drivers, bedding packs, bicycle hire and so on. Should you have any questions or queries then please ask us! Your security deposit will be payable before vehicle handover by debit card, credit card, cash or bank transfer. You must be over 21 years old to book (25 years old for motorhomes) and have a clean license. You must inform us before booking of any endorsements on your driving license. 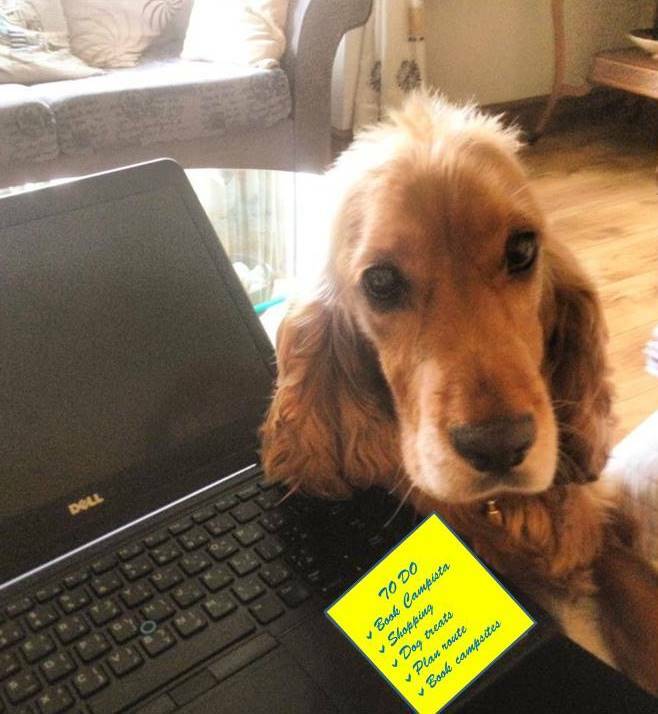 Pets - don't forget me! As animal lovers ourselves we accept one well behaved ped subject to our terms and conditions. Please ensure you are familiar with these beforehand. Don't forget you can also book your cat into our cattery and care for him/her while you are away. 'I','me' and 'my' refers jointly and severally to the person or persons who are the customers. ‘Customer' or ‘hirer’ means the person or persons nominated as the hirer under the heading 'Hirers Name / Contact' on the Rental Agreement, any person whose credit or debit card is presented in payment of the customer's charges, or any person who deems themselves to be the legal entity and ultimately responsible for the motorhome. Should the legal entity be different from the driver, then full name, address and contact phone numbers must be supplied. ‘Rental Period' means the hire period as stated on the Rental Agreement or any agreed variation thereof and any additional period during which the vehicle is in the customer's possession or control. 'Vehicle' means the vehicle as stated on the Rental Agreement and includes tyres, tools, accessories, the living equipment and any other special equipment, documents related to the Vehicle and any replacement or substitute Vehicle which may be provided at the discretion of Campista Limited. 'Living Equipment' Includes but is not limited to, TV, DVD player and aerial, Oven, Radio/CD player, crockery, cutlery, cooking utensils. 'Security Deposit' means the amount held as security by Campista in relation to this hire. ‘Overhead damage’ is deemed as any damage sustained to any part of the vehicle, its equipment and or any third party property which occurs above 6 feet (1.83 metres) in height measured from the ground upwards. Collection and return days are as arranged with each customer and as per the booking. Vehicles must be collected and returned to the same collection/return site unless otherwise agreed. One way rentals are generally not possible. Campista is unable to deliver the motorhome to a customer’s location unless specific arrangements are made in advance. Campista will supply full breakdown cover to cover any mechanical faults to the base chassis of the motorhome. Any call out charges necessitated by the client through operator error, e.g. a flat vehicle battery, wrong or insufficient fuel, keys locked in Motorhome etc will be the responsibility of the client. Breakdown cover will not cover operation of the habitable part of the motorhome. It is therefore vital that the hirer understands the correct operation of the motorhome so any problems or defects can be rectified. In such circumstances, Campista will work with the hirer to resolve the situation as far as reasonably practical. This ranges from 3 to 7 nights depending on the season. Campista reserves the right to increase the minimum hire period for certain events. Availability is on a request and confirm basis at the time of reservation. A reservation is only binding after it has been confirmed by Campista and a deposit payment of 20% of the total hire cost has been received. Campista’s terms and conditions including cancellation policy apply from this point onwards. Once the reservation is confirmed, a confirmation email will be sent out to the client. Settlement of the remaining balance will be due eight (8) weeks prior to departure. Campista reserves the right to cancel the booking if payment is not received eight weeks prior to departure. Payment is by credit card (Visa or MasterCard only), debit cards, bank transfers, cash or cheque in Pounds Sterling. For late bookings (less than eight weeks before departure) the full rental price is payable on booking. Vehicles will not be released without full payment being completed and the required handover processes complied with and completed. Cheques will not be acceptable for late bookings (less than 2 weeks prior to departure). Transferring of money from one hire to another may only be possible at the discretion of Campista. a) All rental charges. Total charges as set out therein are not final. (The hirer agrees to pay any shortfall in charges to Campista and will receive a refund for any overcharge acknowledged by Campista). Traffic violations – driver details will be passed on to the issuer of the fines and Campista will not be liable. This will include all road and traffic violations including speeding and parking fines. Collision damage waiver This reduced the standard insurance excess of £1,000 to nil and is highly recommended. (*) Vehicles will be handed over to hirers at the start of the hire period with a full tank of fuel. Two gas cylinders will be provided, at least one of which will be full, and the other part full. For those travelling within Europe there is an additional charge of £10.00 per night for European cover (including European roadside assistance). European cover is mandatory and you will be in breach of these terms and conditions should you take a motorhome into Europe without taking out the additional European cover. Travel outside of these countries listed above will be in breach of these terms and conditions and you will not be covered by any insurance. Please check your route carefully and ensure it doesn’t go outside these countries. For those travelling within Ireland there is an additional charge of £5.00 per night for your Ireland cover (including Irish roadside assistance). Ireland cover is mandatory and you will be in breach of these terms and conditions should you take a motorhome into Ireland without taking out Ireland cover insurance. Collection: Please allow 1 hour for the hand-over at the collection site- to complete the documentation and demonstrate your vehicle to you. All drivers need to be present on collection of the motorhome and bring their full valid license and passport and credit or debit card for the security deposit payment. Please see section 21, Drivers for further details. Campista will make every effort to have your motorhome ready for the collection time you have selected however Campista cannot guarantee that your vehicle will be ready for this time. Should this be the case no refunds will be due to you, there will be no extension of your hire, and the motorhome will still be required to be returned in accordance with the details set out below . Return: The vehicle must be returned on the correct date, and before the time stated on the rental agreement - please allow 1 hour for the hand-over at the depot. Vehicles must be returned undamaged, with a full tank of diesel and gas, empty waste water and toilet cassette and the interior clean and in the same condition as they left the depot, otherwise a charge will be made for additional Valeting and or Upholstery cleaning. In addition a separate toilet cleaning fee will apply if the toilet waste tank is not empty on return. Please see section 6, Rental and other charges for further details. Please note: there are no toilet emptying facilities at Campista’s collection/return site so this must be emptied prior to return. Late return: If you will be late returning, Campista must be advised immediately. Failure to advise may result in prosecution for driving whilst uninsured. An additional charge of £100.00 per hour will be payable for all late returns. Campista will carry out a full Pre Checkout Inspection (PCI) on every motorhome before the commencement of hire. The PCI involves testing every system on board the motorhome to ensure they are operating correctly. In conjunction with this the hirer will be taken on a tour of the motorhome and shown how each system works. Should an onboard system fail during your hire, Campista will make every effort to remedy the fault whilst you are away but in some circumstances this may not be possible and Campista cannot be held responsible and will not refund any monies should a loss of service be encountered nor have any obligation to provide a replacement vehicle. In the case of winter hire, Campista will not be and cannot be held responsible in the event of any damage or inconveniences caused by freezing conditions. This is the responsibility of the hirer. At the time of collection the hirer will be required to accept the condition of the vehicle as set out in these conditions including any documented adjustments accepted by both parties at the time of the handover. Campista will take a date stamped photographs and/or video of the vehicle before collection and after return. Campista reserves the right, at its absolute discretion, to substitute a comparable or superior Vehicle for the Vehicle ordered. In that event, the hirer shall not be liable for any increased rental pertaining to the substitute vehicle. Such substitution shall not entitle the hirer to any refund and does not constitute a breach of this Agreement. There is a refundable Security Deposit payable by credit card, debit card, cash or bank transfer prior to collection of the vehicle. If payment by cart, it should be in the lead drivers name and the amount will be taken from his/her account. Pre-paid currency cards cannot be accepted. Campista reserves the right to increase the security deposit in certain circumstances or for specific events e.g. World Cup events, Festivals, clients travelling with pets, for any other hire where the Motorhome is carrying 4 or more adults and if the security deposit is paid in cash. Cheque payments are not accepted against the security deposit. b) The hirer irrevocably authorises Campista Limited to deduct from the Security Deposit any amounts due by the hirer to Campista Limited arising out of this Agreement. c) The security deposit will be refunded within 7 working days of the vehicle being returned to the collection/return site as per the criteria set out in section 9 Motorhome collection and return and there are no outstanding insurance claims. It will not be refunded on return of the motorhome. If it was paid for in cash, this will be refunded by bank transfer within 7 working days. Any deductions from the security deposit will be advised by Campista to the hirer in advance of the deductions being taken. d) Should any damages exceed the security deposit the hirer will be responsible to settle all additional costs over and above the security deposit value within 7 days of the hire end date. Note: Where the hirer has opted for the CDW option and has complied with its terms stated below (clause 23), no excess will be charged in the event of a Road traffic accident (RTA) or collision, but the hirer should be aware that the security deposit will be used to fund any loss or damage what so ever to equipment, fixtures and fittings, windows, valeting or upholstery fees or negligent damage to the vehicle. Should these damages exceed the security deposit held, the customer will be liable for the total cost and the difference will need to be settled within seven days of returning the motorhome. iii. Who is not authorised by law to drive the Vehicle. Particulars of a proposed licensed driver of the Vehicle are set out under the heading 'Hire’s name/ contact’ on the Rental Agreement. k) Used to tow any vehicle or trailer. o) Otherwise used in breach of the hirer’s obligations under this Agreement. The hirer acknowledges that Campista Limited retains title to the Vehicle and its contents. The hirer does not have any right to pledge Campista Limited’s credit in connection with the Vehicle and agrees not to do so. The hirer shall not agree, attempt, offer or purport to sell, assign, sublet, lend, pledge, mortgage, let on hire, or otherwise part with or attempt to part with the personal possession of or otherwise deal with the Vehicle. All Campista vehicles are non-smoking vehicles. Campista reserves the right to impose additional Valeting and or Upholstery cleaning fees and charge should smoke be detected in the vehicle. Campista authorises the use of these vehicles up to the stated number of passengers. Each person is to use the safety restraints provided at all times whilst the vehicle is in motion. Carrying more than the specified number of passengers is against the law and in breach of this agreement. Child seats are not available unless by special request and it is the responsibility of the hirer to supply and fit them. Children up to 12 years of age or 135cm in height, which ever they reach first, must use the correct child restraints appropriate for their weight/height under UK law. The hirer will not allow any animals to be carried in the Vehicle, unless otherwise agreed with Campista and the Campista dog policy adhered to. v Pets should be kept under control and not be a disturbance to other members of the public. v Pets must not be left unattended in the motorhome or camper and must be in the charge of a responsible adult when exercising them. v Animals other than dogs can only be accepted with specific permission from the Campista. v The hirer agrees to clean up dog hairs that may be left behind in the motorhome/camper. Cleaning equipment is provided by Campista. · Standard insurance: 25 to 70 years. · Insurance for over 70’s drivers: 71- 75 years. This is by special request and agreement only with Campista & their insurer. Campista must be notified at the time of booking should any driver be over the age of 70. Additional information will need to be provided. Cover is not guaranteed. All drivers must have held a valid license for more than 3 years than entitles them to drive a UK category B vehicle up to 3500kg GMW. Driver must be able to demonstrate that they have driven on a regular basis (More than 3 times per week) for at least 3 years and feel confident to drive a vehicle of the dimensions of our largest motorhome 7.2m long 2.4m wide and 3.2m high. Drivers holding only an automatic license can only hire our auto models and this must be declared at the time of booking. All drivers must be present at checkout of the Motorhome. No exceptions can be made. Production of a full, valid standard driver's license, as well as a valid passport are required from all drivers at the start of hire. Driver’s GB photocard driving license and NI (National Insurance) number must be presented at collection in order for license details to be checked on the DVLA’s online system. Campista is unable to insure any driver if these details have not been checked on the DVLA sites. Driver’s with a Northern Ireland license must supply both the photocard and paper counterpart of the driving license. All drivers whose licenses are issued outside of the EU or Commonwealth are required to supply a valid International driving permit alongside the standard license at the start of hire. This must be issued in the country your standard license was issued and confirm you are able to drive a UK category B vehicle up to 3500kg GMW. Should no driver on a booking present all correct documentation and identification on collection of the motorhome or do not meet the driver requirements stated in the terms and conditions, then Campista will be unable to release the motorhome and no refunds will be given. Endorsements on licenses: the hirer must declare at the time of booking if there are any endorsements on his/her license. Any additional charges imposed by the insurance company will be payable by the hirer. Insurance claims: The hirer must declare at the time of booking if he/she has made or had vehicle insurance claim made against them within the last 5 years. Campista may not be able to get cover should any driver have had 2 or more claims within the last 3 years. Drivers are personally liable for all legal penalties (e.g.parking tickets, congestion charges, speeding fines, toll charges) which are incurred during the period of hire. Campista is unable to insure any driver with no fixed abode. The Vehicle is insured for damage to the Vehicle and the property of a third party; but does not include any personal insurance for the customer (including death or bodily injury to the driver) or cover any personal possessions. The hire rate quoted includes a standard excess of GB£1000.00 per accident or reported incident. In the event of any damage to either the vehicle or third party property, the hirer will be liable for the first GB£1000.00 per claim. Only persons named on the Rental Agreement are insured to drive the vehicle. Please note that no insurance cover (including CDW) is offered for overhead damage, any damaged deemed as gross negligence, or any internal damages therefore the hirer accepts fully liability for these which is in addition to the standard vehicle excess should that apply. Windscreens and /or tyre damage is not covered by the standard vehicle insurance and therefore excess, however Collision Damage Waiver (CDW) does cover these items, (conditions apply), please see section 23 for further details. Campista will be responsible should damage to personal possessions or bodily injury occur (including death) as a result of proven gross negligence on Campista’s part i.e. actions or failure to act. Campista will not be responsible for any loss which is a side effect of the main loss e.g. loss of profits or opportunity. This is separate from the vehicle insurance provided. In some cases, Campista will incur additional charges if the driver to be insured has a traffic conviction, more than 1 insurance claim or is in an occupation which is deemed high risk. These charges will be passed onto the customer. Collision Damage Waiver at £25.00 per night will reduce the £1000.00 excess for damage caused due to a Road Traffic Accident (RTA) or collision (i.e. reported accident) to either the vehicle or third party property to £0. It will also cover the cost of replacement tyres or windscreen. However it will not cover any damage to the vehicle or third party property caused through a reversing manoeuvre or replacement or repair of windows. No insurance cover is offered for overhead damage, any damaged deemed as gross negligence or any internal damages therefore full liability will apply. CDW applies in respect of a first incident and or claim, not the entire Rental duration. Once an accident has occurred CDW cannot be restarted and standard insurance terms will apply. Incident must be reported to Campista within 24 hours otherwise CDW cover will not apply. Should the Terms and Conditions not be adhered to, the CDW will be void and the customer will be liable in full for all costs and damages. Please note that the CDW is completely optional and can be decided upon collection of the vehicle. After the hire has commenced, CDW cannot be taken out. CDW cannot be offered to drivers over the age of 70. Collision Damage Waiver (CDW):this is included as standard for clean licenses of drivers between 25-60 years old. CDW may be applied to other drivers as per insurance stipulations and additional charges may apply. Please ask for further details. CDW may not be possible for drivers with non-UK driving licenses. In such cases Campista may apply an additional security deposit. a) The Vehicle is insured for damage to the Vehicle and the property of a third party; but does not include any personal insurance for the customer or their possessions. b) Neither the Standard Insurance nor Collision Damage Waiver (CDW) covers overhead damage. The hirer will be responsible for the cost to repair all damages. c) The hirer will have to pay an excess for any Insurance claim regardless of which party is at fault for the accident. The insurance excess is £1000.00 per claim, not per rental. d) The excess may be reduced or removed, in most circumstances when a Road traffic accident (RTA) has taken place, by taking out a CDW. Terms apply; (please see clause 23, CDW). If CDW was accepted by the hirer, it is set out under the 'Insurance Declaration' on the Rental Agreement and an additional premium must have been paid. f) The hirer will be responsible for any damage caused through gross negligence and will not be covered by the insurance including CDW. vi. Assist Campista in handling any claim arising from any event, including providing all relevant information and attending Court to give evidence. b) Acknowledge that the excess or other amount due by the hirer in respect of any damage arising from an accident, loss or damage is payable at the time of reporting the event and not at the completion of the rental period, regardless of which party is at fault. c) Pay for any costs relating to the delivery of a change over vehicle as a result of an accident regardless of which party is at fault. Campista offers guests the use of bicycles, subject to them being pre-booked and included in the booking fee. It is the hirer’s responsibility to check the bicycles to ensure safety and adequacy for use. Any defects should be reported to Campista as soon as possible for rectification. Campista will not be held liable for any accident or injury arising out of the use of bicycles supplied, or indeed any other bicycles brought by hirers. It is the hirer’s responsibility to comply with safe riding and to supply and wear cycle helmets as necessary. The hirer is responsible for the safety and security of bicycles during the hire period. Loss or theft of bicycles may be charged for. It is the hirer’s responsibility to supply lights and locks as required. In order to process your booking Campista needs to use the information provided such as name, address, any special needs etc. Proper security measures are in place to protect hirer’s information. The information may also be provided to security or credit checking companies, public authorities such as customs/ immigration/DVLA if required by them, or as required by law. Campista will not, however, pass any information onto any person not responsible for part of your hire agreement. This applies to any sensitive information that you give us such as details of any disabilities, or dietary/religious requirements. In making a booking, the hirer consents to this information being passed on to the relevant person. Campista’s use of your information is subject to their policy and is their responsibility. The hirer is entitled to a copy of your information held by Campista. If you would like to see this please contact us. Campista will hold your information, where collected by us, and may use it to provide you with holiday or special offer information. If you do not wish to receive such approaches in the future, please write to us. We will not pass your information on to any third parties for marketing use without your permission. 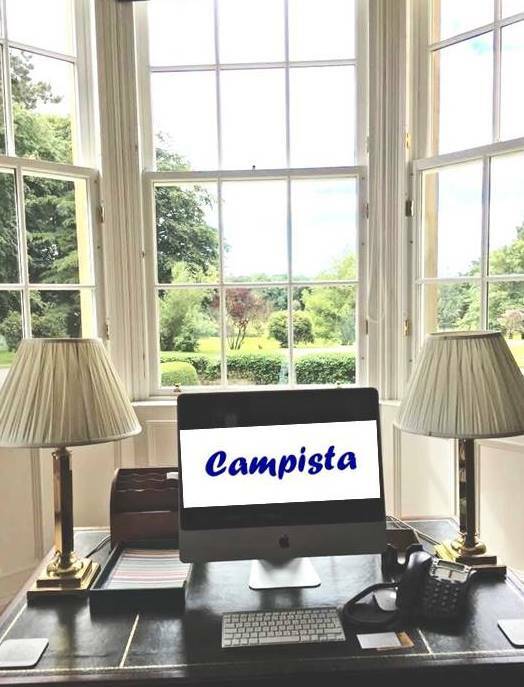 Campista Limited reserves the right to update, edit and change these rental terms and conditions as necessary at any time.